Tens of thousands of U.S. vehicles may contain counterfeit airbags, according to a new NHTSA investigation. The federal government has issued a warning to car owners whose airbags have been replaced in the last three years. According to the National Highway Traffic Safety Administration, airbags may have been replaced with counterfeit bags. The agency reports that approximately 0.1 percent of the U.S. vehicles are affected. Although a seemingly small percentage, the figure translates to tens of thousands of vehicles. Government testing shows that counterfeit airbags may fail to properly inflate or fail entirely. In one case, a counterfeit bag expelled pieces of metal shrapnel upon impact, said the NHTSA. Car owners are being instructed to check www.safercar.gov for more information on the problem. Owners will find automaker call center information, as well as a preliminary list of all makes and models that may contain counterfeit airbags. The full degree of the issue is not currently known and the list is expected to “evolve over time,” according to the NHTSA. Although the list contains dozens of vehicles, owners should only be concerned if their vehicle has had its airbags replaced over the past three years by a repair shop, rather than a new car dealer. Owners of affected vehicles are advised to visit a dealership for airbag inspection. It generally costs roughly $100 for airbag inspection, but the cost may increase depending on the number of airbags. Officials indicate that the counterfeit bags were sold to auto body shops as legitimate airbags. The issue does not affect auto dealerships, because they buy parts directly from the automaker. Unfortunately, only 37 percent of auto dealerships have their own body shop, meaning that consumers may have visited body shops unaffiliated with automakers. 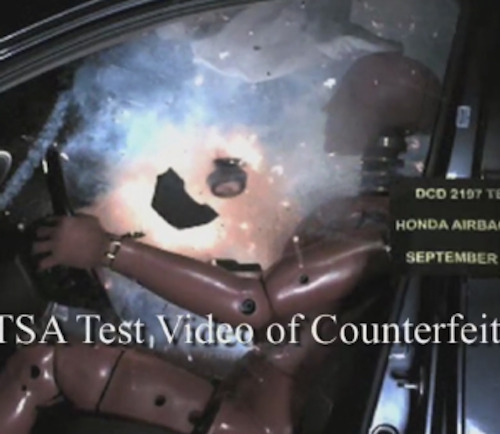 Counterfeit airbags have been a major problem for industry officials as of late. In August, a North Carolina auto mechanic was arrested after federal agents found nearly 1,600 counterfeit airbags in his possession. The same mechanic was also tied to another counterfeit bag case last year in Tennessee, according to the Charlotte Observer. Just last year, a Chinese citizen named Dai Zhensong was sentenced to 37 months in prison for trafficking counterfeit airbags. Zhensong, who was part owner of the international department of Guangzhou Auto Parts, created his bogus airbags by making molds out of authentic airbags that were torn down. Zhensong then sold the airbags for $50 to $70 each, which is well below the cost of genuine airbags.